Notes: "Captain Future" was originally a character featured in a series of American pulp-magazines primarily written by Edmond Hamilton. Toei animation's version adapts 13 of these stories. Where there is trouble in the universe, you can count on Captain Future to make sure the bad guys lose. Whether it involves parallel dimensions or time travel, he can hang in there and fire laser pistols with the best of them. Don't ask him for fashion advice, though. The disco '70s theme says it all. Captain Future is irrefutable proof that sometimes anime history deserves to stay that way. While it aired at approximately the same time as Angel, Captain Harlock, and Galaxy Express 999, it has none of the charm of any of those series - indeed, it's hardly recognizable as being any different from any manner of American cartoons of the era. And whereas the three series mentioned have retained at least a modicum of respect over the years, with Angel (Hana no Ko LunLun) even being revived as part of a memorial video game in the mid-90s, Captain Future has become beyond archaic, almost hilariously dated in appearance, quality, and even music. The English dub only accentuates the unbearably high cheese factor of this show, which makes Superfriends look, well, super. With no redeeming storyline or characters to separate from the other awful qualities of this wannabe Star Wars, this is one trip down Memory Lane that we can all do without. 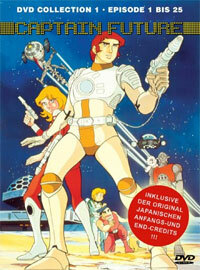 If anything, this series is only good to show just how far Japanese animation has come since the late '70s. After all, at the same time, there was this little show called Space Battleship Yamato that was already beginning to change the way directors looked at anime as a medium. I'm so lucky I was too young for even reruns of Captain Future. I just can't believe people were subjected to such hideous crap ... I'll stop now. Recommended Audience: Once upon a time, kids would've put up with such patronizing pap. Now, I'd expect them to watch the Powerpuff Girls or Digimon instead, and more power to them.